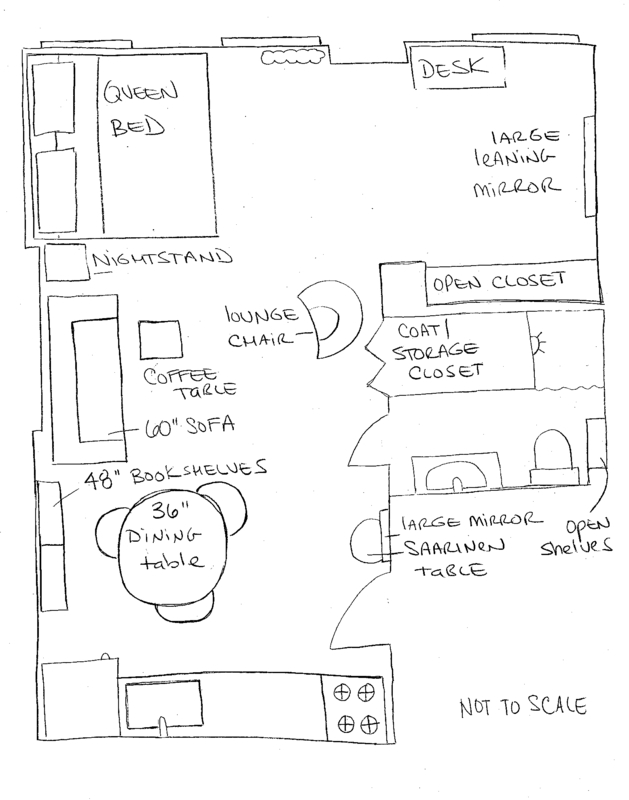 Since I already know the basic floor plan for my new place, I’ve spent the past few weeks trying to find the perfect spot for all the little things. What’s been bugging me the most is where to put the litter box. I’ve finally decided to keep it in the shower stall (not labeled on the floor plan, it’s just behind the coat closet). I placed kraft paper under the box to keep the litter itself from getting everywhere; that stuff is so nasty when it gets wet and I was tired of cleaning it out of the drain. One good thing about it here is I see it every time I use the bathroom as it’s directly opposite the toilet, so I clean it out more often than I used to. Eventually I will have a shower curtain which I’ll leave open a bit for the girls to come and go. riye, believe me i thought the same thing at first! it is kind of a pain but not more of an annoyance to have it out in this tiny apt. with litter boxes i find it's taking the lesser of the evils on where to put it. but now that i've had it there for a while i'm used to it and it's not so bad…the only other thing i could think of is making a bench style sofa with the litter box hidden inside, but then it's still annoying to get in there to clean it, and in my experience with the litter box it's out of sight out of mind so at least i clean it more now. Good point. Plus at least everybody's (ahem) business is in the bathroom and not competing with more pleasant aromas. My bf has his right near the kitchen and I swear his cat is timing his litter box visits to coincide with our dinners. This probably sounds crazy… but I'd suggest training your cat to use the toilet. That way you dont have to deal with the litter smell or where to lug the box… Its surprisingly easy. A good friend of mine taught her older cat how to do it in a matter of a couple of weeks. I'm sure if you google it, there will be good ideas on how to get started and keep it up!AND, how cool is it to tell guests you cat is literally potty trained!good luck! I'm loving your blog. But it's actually really bad for cats to use the toilet. The water that goes down the drain isn't cleaned properly for cat poop. I am sure you can find more on this if you google it. i'm glad to have the craft paper idea for under the litterbox! I have relatives who have multiple bathrooms yet keep one litter box for 4 cats in their kitchen under the breakfast bar, just 2 yards from the stove, and closer yet to the fridge. It always smells, when you walk in through the side door, because it's also close to that little hallway. I finally told them it was a bad idea, but they said they didn't want to smell cat biznezz when they were doing their biznezz. It is not a problem to remove a cat box in order to shower, because it stay in the same area, and again, you can clean it twice a day so it's super fresh!